To find out how we set out to achieve those aims, read below and browse this site. If you are a Macpherson (or MacPherson or McPherson) or from one of our many Associated Families, join us. Details can be found on this site. Started in 1946 by a group of clansmen in Scotland, the CMA now has a world-wide membership, from New Zealand to Sweden, from the United States of America to Borneo, with its traditional heartland being Badenoch in Scotland. Where a country has a sufficient density of membership local branches maintain local contact, but whether a member of a branch or not, we are all part of the Clan Macpherson Association. Branches operate in Australia, Canada, England & Wales, Europe, New Zealand, Scotland & Northern Ireland and the United States of America. Branches have their own pages on this site, and they can be accessed from the menu above. The name Macpherson, MacPherson, or McPherson, according to the spelling preferred by individual families, comes from the Gaelic Mac-a-Phearsain and means literally "Son of the Parson". Mhuirich Cattanach, Fourth Chief of Clan Chattan, was made Parson of Kingussie, and his second son was the first to be called Macpherson. The banner header shows several places of significance to the Macphersons. From the left these are: the view of the River Spey from Cluny's Cave where he hid after Culloden, the Clan House in Newtonmore which houses the Clan Macpherson Museum, and the hill in Badenoch called Creag Dhubh, from which the Macpherson war cry is derived. On the left of the header is our (the CMA's) Coat of Arms and, on the right, the CMA Badge. As well as local Branch activities, the Gathering is held each year in Badenoch, where members from all over the world come together to dance, sing, talk and enjoy each other's company. This happens on the first full weekend in August, and coincides with the Newtonmore Highland Games, our "own" games. 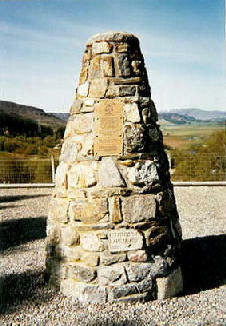 The Cairn, to the left, is a symbol of our world-wide spread with a foothold for all in the root of our families. Built on Macpherson ground in Badenoch, it is constructed of stone from all around the world, sent by Macphersons from where they live. To give commitment to our objective of preserving our history, the CMA owns and runs the Clan Macpherson Museum, also in Badenoch, in the town of Newtonmore. You can find information about the museum, and make a virtual visit and tour, by following the link on the menu.